This game in particular was the final time fellow Cru’ member Corey would be gearing up in the Cru’ Blue. The sun was out with a strong showing of our American forces at Koiwa station. Still though, not as strong as we’d hoped. 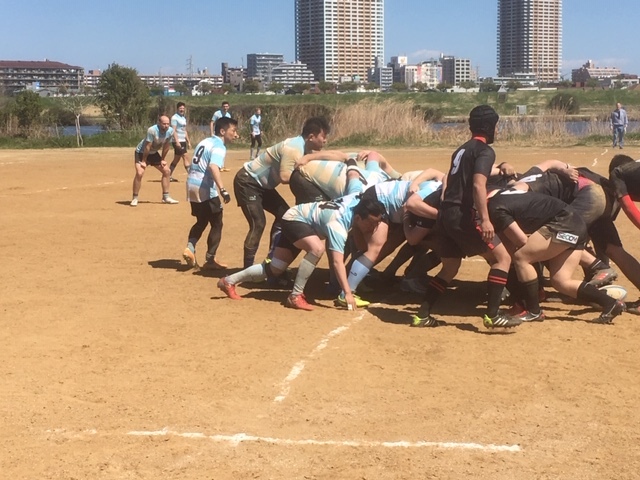 With many of our followers broken from previous games, Sparrow and Brett to name a few, so we had to rely on our Japanese captain Jay (Junki) to lead the forces through a narrowing battle of blind tackles and broken dreams. The bus ride to the pitch was still full of high spirits as we saw a return of our fabled twins (John and Brent) make it just in time to ride out the Cru bus (sponsored by Koiwa station). As well as the Cru’ cowboy James Duncan wearing his 10-gallon hat of power. Arriving to the sand blasted pitch seemed to break our spirits temporarily, but it was restored once Travis gave us the low down on how we can keep our hopes alive. Sadly, it was that we needed to remove the rocks from the pitch as much as we could during warm-ups. This helped us out believe it or not as we took turns throwing rocks off to the side that would’ve made a difference in the game or…just in general as they looked painful. Finally, the time had come…the ball was kicked into the air and we could feel all of the momentum coming at us at once…well Nathan did when he hit the ground after catching the ball. The Cru’ was quickly struggling to gather their footing as this team hadn’t played together nor played in a while at all. The Girls however were not a force to be reckoned with. They hit hard and had great handling skills as well as team work. Needless to say, we were not going down without a fight. As Corey geared up his last time with Goggles of clear vision and scrum hat of dexterity, he charged into the dust looking for a fight. Sadly, after a missed tackle due to not being able to see as clearly through the goggles, he threw them in anger off the pitch…never to be worn again. While they reset the ball for play after The Girls’ first try, Travis sprang into action in the gazelle type of running he always does. With multiple tackles we finally got the ball back and started charging down the field towards The Girls’ try zone. Unfortunately, we were stopped about 10 meters shy and turned the ball over and the Girls ran through our forces again for another try ending the first half. Let me ask you. Does a machine like you experience fear? After a crushing defeat, we kept our spirits up with a couple of songs from various Cru’ members. 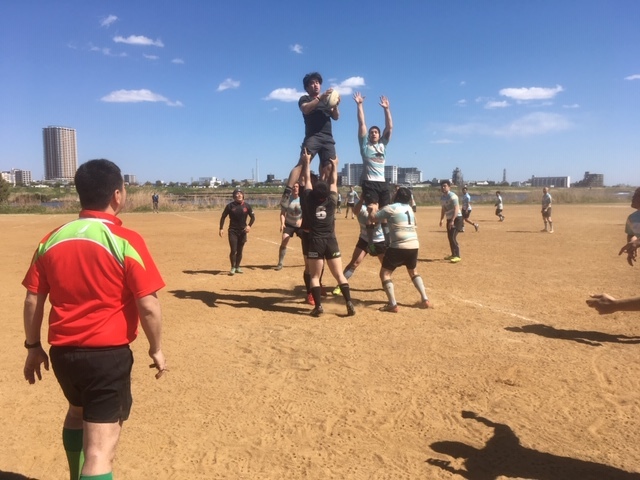 Tooley sang an appropriate version of the Tokyo Crusaders RFC, Corey on the other hand did not…Fast forward from a crowded bus ride and multiple beers/Chu-His we showed up at our infamous Chippy bar. A loving place where beer flowed freely into our stomachs and arguments and discussions took place. We eventually ended up doing a boat race where we were impressed by Cru’ newcomer supporter Caitlín. She threw the beer back so flawlessly that Libby was frozen stone cold in awe. This was the fuego we needed to get back in the race. Sadly, James Duncan decided he wanted to sip his beer casually which overall caused Corey’s team to fall short and Brett to have his victory that day. 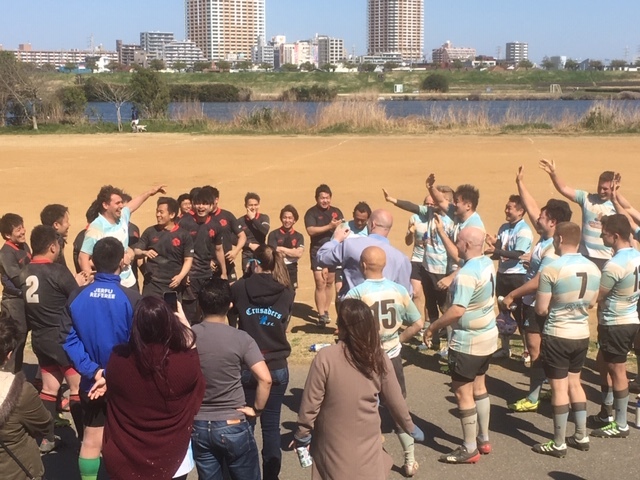 TLDR: “There was a ball, people ran, lots of tackling, dust and rocks…we lost…beer…” – Laura Ní Riada.